I am a London taxi driver, writer, and former Knowledge of London Examiner (no need to call me Sir any more, we’re all equals here). I’m also a qualified Careers Adviser, and a failed secondary school teacher. I shall use this blog to comment on taxi trade issues, current affairs – and sometimes for the purpose of general silliness. These are challenging times for the taxi trade, but I shall avoid Gloom & Doom as much as possible. I believe people survive with a sense of humour. Why Pubcat? Simple: I like pubs and I like cats. I’m not much of a socialite, but I’m sat on a cushion in my favourite ale house taking everything in. That’s my house-tiger, Rocky, pictured above. He helped me pass the Knowledge for the second time, in 2010. My book, From Manor House Station to Gibson Square – and Back Again, is available now from York Publishing Services (YPD Bookshop). Wonderful profile. As I’m also a lover of pubs & cats, I shall visit this site often, oh & also because we are old, old friends!! Good luck with it Chris. Gawd Bless Ya! You’re the first – and only? – person to comment on this site. Old friends indeed – and I haven’t forgotten about sending you more pics from HK Lewis. Thank you for your kind comments. I intend to write something every week, if I get time. Driving a sherbert dab five days. a blog artile or vice-versa? My sute discusses a lot of tthe same topics as yours and I believe we could greatly benefit from each other. Please forgive my late reply, and my cautiousness. Please tell me a bit more about what you have in mind. Chris. I sadly never had the pleasure of meeting you on appearances but would like to invite you, if you are willing and have some spare time, to do a talk with a number of KOL boys at the call over school…. kalloverlondon. We currently have around 20 students that would benefit greatly from a chat, I am myself on appearance level still, and found an opportunity to create a place that students could afford to attend, it is non profit and anything that is earned goes back in to make it that little bit better where possible. Unlike some of the bigger schools we try to provide free advise and welcome trials to see how people like the set up and to see whether it is for them. Loos and wish you all the best where ever you go life long and healthy life it’s an old Somalian saying. Thanks for your kind comments, sir. If it wasn’t easy, it wouldn’t be worth doing. After passing the K, you know you can do anything. It gave me the confidence to go to college and university. The K was harder than my two degrees put together. Keep at it, you’ll get there! Currently on 28s was lucky enough to meet you on a appearance just before you left and managed to score my first B, Thanks! Came across as a very approachable person that straight away put me at ease. One question seeing as you are a careers advisor, would you advise people this is a profession that is still worth all the effort we have to put in to obtain the green badge. Starting to get disillusioned with all that is going on. The amount of minicab’s that is on the road now is not so much a joke as a disgrace. Roads seem at a standstill and are only getting worse. I’ve put too much in to even think of giving it up but if I was looking to start the K now im not sure I would. Honestly if I came to you looking for carers advice and said to you im thinking of doing the K, what would you advise me? Really enjoyed your blog and your background. 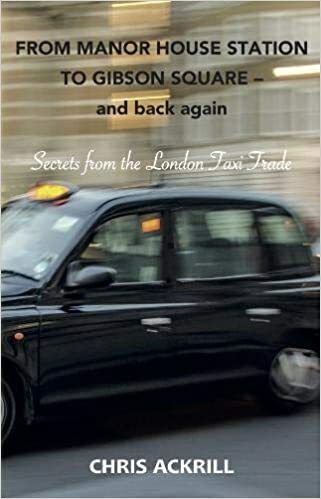 I was wondering if you’d be open to talking about a short documentary about a London cabbie I am shooting in Sept. in London? We want to cover everything from your background to the impact of Uber. If you’re not interested, maybe you know someone who might be? This sounds intriguing, but I’m more a writer than a talker. Could you tell me more? Are we talking TV? For how long? Will other drivers be involved? When will From Manor House Station to Gibson Square- and Back Again be published, and where can I buy it? 500 books are in the process of being printed up. I’m expecting 100 copies to be sent to me next week. You can buy a copy from me directly. The cover price is £9.95 and there’s a 5p handling fee. I thank you for your interest. I’ve just subscribed to your blog – very impressive. Thinking about my book, it hasn’t been launched yet and I’m as yet unsure how best sell it without costing myself or my valued customers extra money. Ideally I’d like to sell it directly from the back of the cab, but realistically it’ll mostly be sold through York Publishing Services who produced it, and will be helping with promotion and marketing. It’ll cost £9.95 plus postage. It’ll be on Amazon, but I probably won’t recommend people buy it from them as they’ll take a big cut. All will be revealed soon. I’ll let you know when I hear more – next week probably. Blimey! I didn’t even know it had been publicised . I haven’t been sent any copies yet. How did you find it?! You’ll probably be the first person to read it – well done!